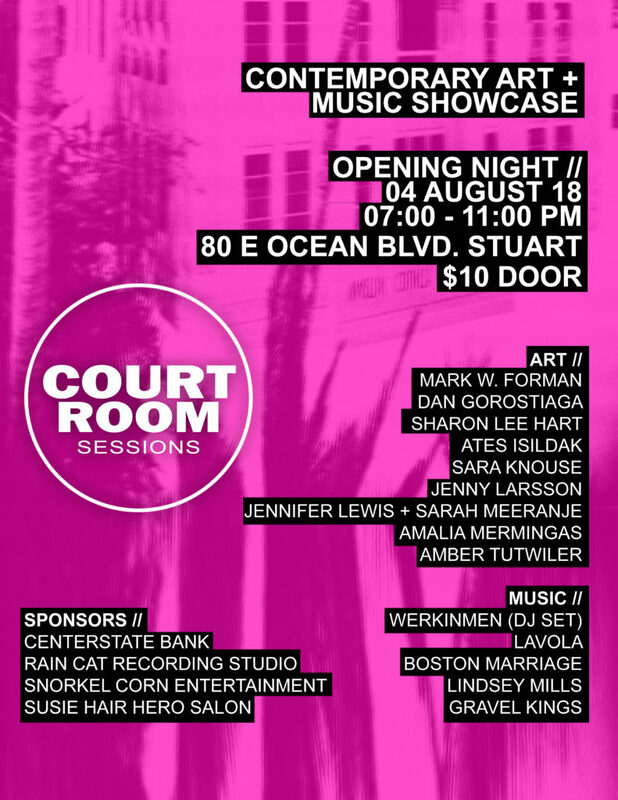 Striving to break the norm of familiar arts and music within the community, Court Room Sessions returns for its second installment, providing a counterculture experience to those who attend. The opening night will take place at the Court House Cultural Center located at 80 E. Ocean Blvd., on Saturday, August 4th from 7-11 PM and features contemporary works by artists from across South Florida. Alongside an impressive roster of visual artists, the opening night will also feature live musical performances by notable South Florida acts LAVOLA and Lindsey Mills, Orlando-based indie rockers Boston Marriage, as well as the highly anticipated return of the Gravel Kings, who haven’t played a show in over a year and are ready to hit the stage and wow crowds with their eclectic mix of indie folk and classic Americana. The Arts Council is the designated local arts agency for Martin County. The Arts Council provides services to visual and performing artists, arts organizations, students and the public while striving to instill a passion for and participation in the arts. For more information, please call 772-287-6676 or visit www.martinarts.org. The Arts Council is sponsored in part by the Florida Department of State, Division of Cultural Affairs, the Florida Arts Council, the National Endowment for the Arts, the City of Stuart, Martin County Board of County Commissioners as well as corporate and private contributions.